I am the seventh of fifteen cousins. I am one of three girl cousins who were born within less than a year of each other. We weren't always able to get together as often as we liked, but they were both my pen pals for years when we were kids. Oddly enough, the other two had their first children three months apart. When I had my daughter, they each had their second and all three babies were born within five months. The oldest of us just had her third baby and I wanted to make something special to welcome him to the world (and pamper her a little). I chose to make her a tote bag from Bend the Rules Sewing and two head scarves from Weekend Sewing. This baby is her third boy, so I thought a little pink would help her in the house full of testosterone! For her baby, I chose to make the scalloped baby blanket from Bend the Rules Sewing. I love these blankets. The scallops just add so much style. Instead of leaving one scallop open to finish the blanket, I sewed the whole blanket closed, and then cut a small slit toward one edge, and pulled the blanket through. When I'd done all the ironing and quilting and top stitching, I closed the hole with fusible stripping. Then I sewing a linen patch (backed with fusible interfacing) over the hole and wrote the baby's name with a fabric pen. I also signed it with my name so he'll always know it came with love from his mommy's cousin. 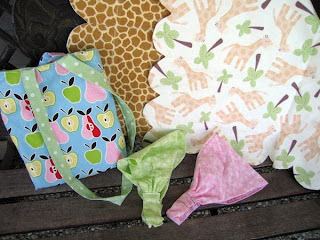 Isn't the double giraffe pattern so cute? I couldn't get over the it. 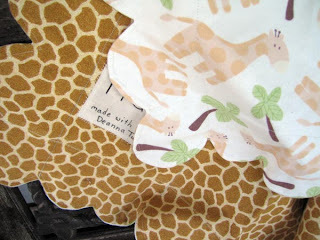 Giraffes are one of my favorite animals, and I almost decorated our nursery in giraffes. Both fabrics are flannel, but the cream colored side is softer than the skin print. I got both prints at JoAnn Fabrics and Crafts.